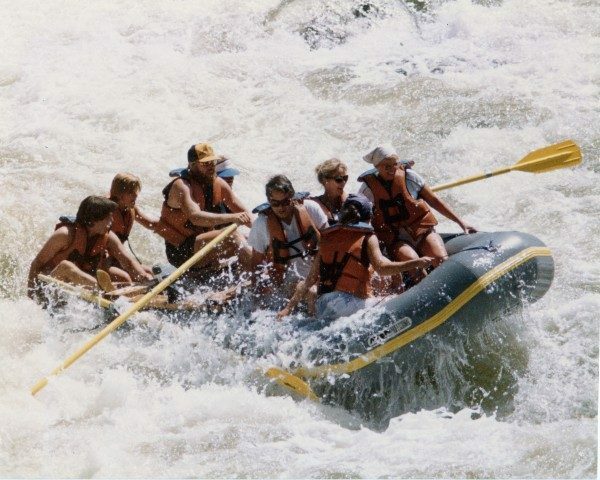 WE had a home in Aspen so on a few occasions we would raft the Colorado. We did this as a day trip out of Glennwood Spring Colorado. In our photo above is my mom, dad, Joan and myself – we are game for adventure. We started east of Glenwood Springs by heading up river about 9 miles to the Shoshone Rapids in Glenwood Canyon on the Colorado River. The photo above was back in about 1978. We got off to an exciting start hitting some great rapids like class III-IV rapids including. The rapids are now called “The Wall, Tombstone, Man Eater, Superstition.